The Screaming Pope: Knausgaard or Kierkegaard? 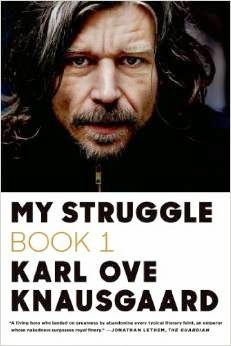 Karl Ove Knausgaard is a Norwegian novelist and provocateur. The six volumes of his autobiographical novel are titled Min Kamp. It’s a no holds barred reference to Hitler. In his Letter from Osterlen (The Paris Review, Winter 2014), he remarks “In the essay De vulgari eloquentia, Dante wrote that the individual variations in human reason are so great that each person appears almost to constitute a species for himself. He wrote that nobody could understand another human by reference to his own actions and emotions, the way animals can. God, therefore, endowed mankind with language, because we were the only creatures who needed it.” Though it may be the booby prize, Knausgaard is obviously in love with language. He’s high priest of art, an Ibsen exploring the realms of imagination and memory with a touch of William Vollmann's relentless pursuit of the fringes of human behavior thrown in. He also exudes the romanticism of Thomas Wolfe’s Look Homeward, Angel in his pursuit of the past. Nothing that is human, including say feces, is sacrosanct. High and low cohabit his work. Here for instance are two quotes from a recent article in The New York Times Magazine (“My Saga, Part 1, Karl Ove Knausgaard Travels Through North America," 2/25/15). The first reflects the writer's fearless preoccupation with bodily functions, “I searched every drawer and closet but found nothing I could use to try to remove the plug of feces and toilet paper that must be clogging the drain.” The second exemplifies his bias towards the higher functions of the brain, “Being so close to chaos all the time, I feared nothing more than the things that could unleash it.” It’s nice to think that language can be likened to the equations and algorithms of math, like say Descartes “Cogito Ergo Sum.” But Knausgaard’s world, as replete as it is with poetry, is lacking in reason and enlightenment. It’s as explosive and unpredictable as the adolescent lust he so vividly describes. The author paints himself in his autobiographical screeds as a little animal of consciousness. Knausgaard’s quote from Dante brings to mind the thinking of another famed Scandinavian writer, the philosopher Soren Kierkegaard, who famously said “truth is subjectivity.”And Knausgaard like Kierkegaard never seems to have abandoned God despite all his doubt. He was consulted on the publication of a new Norwegian version of the bible.